This book was all the rage at BEA this year. I heard several talks about it throughout the weekend, so I was super excited to read it. I received the ARC from the publisher in exchange for an honest review. Ok’s father recently died, which means his mother has to work even harder to pay the bills. As an immigrant, it is hard for Ok’s mom to find a good paying job, so instead she works three different jobs that don’t pay much. After the two had to move to a small less glamorous apartment, Ok knows that as the man of the house, he should be contributing money to the house. Ok dreams up several get rich quick schemes, like braiding hair (if only he knew how to braid), or winning a talent show (if only he knew how to roller skate). 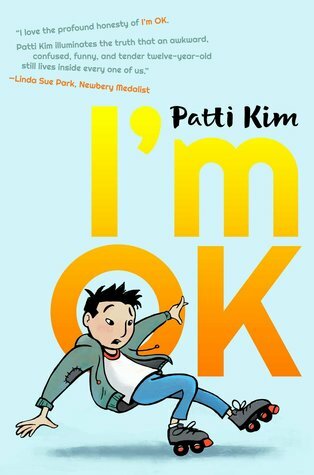 Ok is desperate to find happiness, which is difficult because he is bullied by his mom, the kids at school, and he has no trust for his mom’s new sleezy boyfriend. Ok begrudgingly partners with a girl at school, Mickey, in hopes that together they can win the talent and that she will keep the continued success of his illegal (as per the principal) hair braiding business. He is forced to make decisions about who he will become as a man. Ok was super funny. His hair braiding business was awesome. His attempts to roller skate were super cute. The setting did not feel accurate, it felt more like a historical fiction book (think 80s/90s) as opposed to a book about modern day characters. I enjoyed the growth of the characters. However, I wish some of Ok’s not-so-great decisions were addressed more thoroughly, or he grew beyond the concept of making them. All in all, I enjoyed the book and Ok.